The Watcher in the Shadows by Chris Moriarty. The Sequel to The Inquisitor's Apprentice. Review: Have you wondered what a magical murder would be like? Find out in The Watcher in the Shadows. Read about Sacha Kessler, Inquisitor Wolf, and Lily Astral as they unravel the mystery behind the killing of the Klezmer King. After his very own electric tuxedo kills the Klezmer King, Sacha, Wolf, and Lily ask people if they know who killed him. When Maurice Goldfaden tells them that the Klezmer King's dresser, Sam Schlosky, might have been messing with the electricity and may have caused his death, they know they need to find Sam. They find that Sam travels with his aunt wherever she goes. So, Wolf looks for Sam in every corner of New York City. But finding Sam only creates more mystery. Will they even be able to solve the magical murder without finding more mystery around every corner? 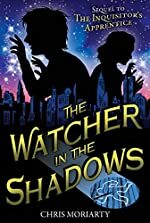 The Watcher in the Shadows is primarily for young adult boys for it's dark plot and colorful language. The setting of New York City made the plot make sense because a lot of crimes happen in New York City. The writing style of the author made in seem suspenseful because some chapters ended in a cliffhanger. My favorite character is Sacha Kessler because he faces many problems and tries to solve most of them, even though he hasn't chosen to learn magic. The plot is great because even though it can be dark at times, the characters and mood of the book change throughout the story. I would recommend this book to be read by anyone who has a taste for the plot of the book.